Hello everyone! Today we’re going to be demonstrating how to find and trace the location of any IP address! We’ll start with a quick introduction to this topic, and then we’ll jump right in. I’m sure most of you know this already, but for those that don’t, each network that is connected to the Internet is given one public IP address (this is due to the implication of NAT). This means that each user on the Internet has a unique address that doesn’t belong to anyone else. This address is what allows us to communicate and access resources on the Internet, such as this very site! Now that we know the usage for IP over the Internet for the average user, we can explain how it applies to hackers. If you remember our article on hping3, you already know how important it is for hackers to hide their IP. In this article, we’ll be demonstrating just how easy it is to track and trace an IP address using IP geolocation. It all comes down to this; if hackers leave their public IP address lying around the place, law enforcement will find it and they will track it. Once they find our IP, it’ll only be a matter of days before they’re breaking down the door! Now that we’ve discussed the use of IP for both users and law enforcement, we can jump into learning how to trace an IP address for ourselves! First things first, let’s discuss the forces that enable us to do this in the first place. There is a company by the name of MaxMind that maintains a database of the location of nearly every known IP address. In order to trace an IP using MaxMind we’d normally have to pay a fee in order to query their database. But our kind friends over at MaxMind also have a developer version of the database available for free download. The only real issue with this is, we don’t have a way to read the developer database once we download it. Or do we? This brings us to our second factor as play, code. Someone released a Python module named pygeoip. This module will allow us to query the database for almost any IP we want! Be warned, the results we will get are not exact. If we want pinpoint accuracy, we’ll need to pay for MaxMind’s service. But, if we want to track IPs for free, we’ll have to sacrifice a bit of accuracy (a fair trade overall). Now that we know about the software we’ll be using, we can begin the process of tracking an IP. So, let’s get started! We can see here that by using the -d flag with gzip, we’ve decompressed the file and now have GeoLiteCity.dat. We finally have the database that we need. Now that we have both of these downloaded and installed, we can finally get to tracking an IP! There we have it! 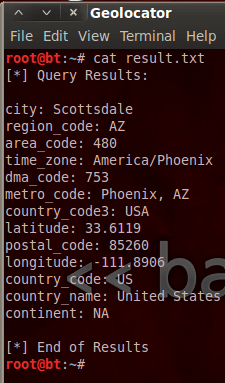 We can see by the contents of our results file above that www.hackingloops.com is hosted on servers somewhere near Scottsdale, Arizona. We did it! 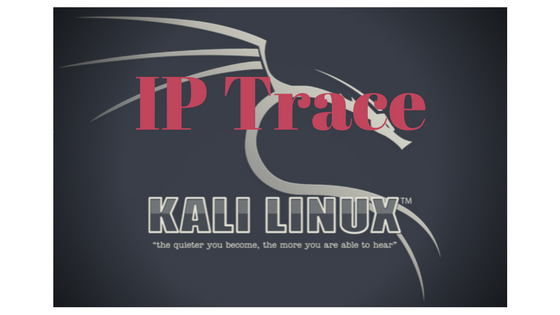 Having this understanding of how to IP Trace can help us to avoid being tracked. It can also prove to be a very useful tool to have in the case that we end up needing to track down an attacker ourselves for whatever reason. See you next time! How is this different from http://www.whois.com? The difference is we’re doing it manually. It’s always better to know what’s going on under the hood. If you know you code, you can do much more than the average hacker. then just use the IP instead of resolving the URL. Simple as that! I don’t have pc how can I do this in my phone…??? You can see the new series on mobile hacking. You should be able to do it after learning about these technologies!